12 and 0 in the welterweight division since turning professional in December 2015, all of Besputin’s fights have come in his adopted home of America. The Russian native has held his power considerably as he’s progressed through the ranks with nine victories inside the scheduled distance. Russian champion on 11 occasions, across various levels, Besputin holds an amatuer victory of Daniyar Yeleussinov and is a two-time European Championship medalist. Aggressive by nature, Besputin has looked well-measured throughout his career, thus far, from the southpaw stance. Favouring full-blooded flurries as opposed to counter-shots or loading up for one punch, Besputin secured the USBA Welterweight belt in September and is ranked 1st by the WBA and 10th with the IBF. A world title shot surely serves as the motivation for 2019 but the 27 year old would be minded to test himself against fellow contenders beforehand. Women’s boxing is going through a purple patch that looks like it’s sticking around for a while. Traditional forerunners, in Latin American boxers, still pave the way but, increasingly, we’re finding talent emerge from their Northern counterparts. Mikaela Mayer is leading the way for Top Rank with the super-featherweight looking to gatecrash the world title scene as imminently as possible. A bronze medal at Qinhuangdao in 2012 – the World Championships – was one of four medals for the U.S.A but it is Mayer who has made the most progress as a professional. Eight undefeated, the 28 year old is the NABF Super Featherweight champion having won the belt in October with a definitive victory over Vanessa Bradford. Leading with the left hand, Mayer’s fights tall and at range, something she’s done effectively up to this point. Defending her title against Calista Silgado on December 14th, Mayer closed the year at 9 and 0 in impressive style and is surely targeting one of the four world champions at 130lbs. Alongside Joe Joyce, Vianello formed a major part of preparation for Tyson Fury’s fight with Deontay Wilder. Invaluable rounds of sparring with the lineal champion preceded an announcement that he had signed with Top Rank Boxing, managed by Sam Jones. Making his debut on the undercard of Vasyl Lomachenko vs Jose Pedraza, Vianello leapt straight onto the big stage and took on Luke Lyons (5-1-1). The Italian made his mark with an immediate impression with clubbing right hands dropping his counterpart on two occasions en route to a 2nd round KO. Nicknamed The Gladiator, imagine Deontay Wilder but with a touch of regality, Vianello looks incredibly light on his feet, floating in and out of the pocket. The Rio Olympian, still 24 years young, looked classy in his opening fight and will be looking to expediate his development throughout 2019. 20 years old and already a professional for three years, Josue Vargas worked his way to 12 and 1 since debuting in November 2015. 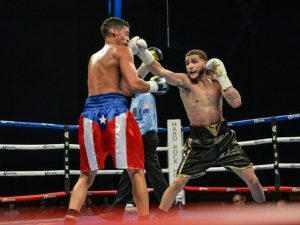 The singular loss came as a result of brash disqualification – Vargas guilty of hitting Samuel Santana when his back was turned – in the third round of his seventh professional fight. Brought in by Floyd Mayweather for sparring, in the build up to his bout with Conor McGregor, the experience has seen Vargas mature in the ring. That’s to be expected for a man still becoming an adult. A flamboyant fighter – and I’m not just talking about his short choices – Vargas sweeps into the pocket, targeting the body of his opponent with relentless passion. Returning, after an eight month absence, on the Lomachenko-Pedraza card, Vargas dropped John Renteria in rounds two, four and five to finish the fight in the fifth round, his eighth knockout win. The 140lb fighter, backed heavily by Bob Arum, will be looking to continue the momentum he’s found with a further three or four fights in 2019. Nicknamed ‘The Prodigy’, it’s clear to see why the Puerto Rican born fighter is thought so highly of in his new home. We’ll stick with the super-lightweight division, for our final pick, as we venture on towards an Uzbek living in Los Angeles – part of a whole raft of ‘-Stan’ suffixed nations with a recent influx of boxers over in America. Arguably the better positioned prospect, in relation to Vargaz, Gaibnazarov is able to make the most of his amateur pedigree. Rio 2016 Gold medallist as well as Silver in the 2016 Asian & World Championships, the 27 year old already has the technical foundations that will be crucial throughout his career. Having shared the ring with Vasyl Lomachenko on the amateur circuit, Gaibnazarov turned professional in April of last year. That debut saw him touch down in the first round, a sign of nerves perhaps, but aside from that he has looked comfortable in his opening six bouts. Fighting from range, Gaibnazarov has a pawing left-jab-turn-hook and stays rocking on the balls of his feet. I’ve been most impressed with the footwork of the Uzbekistan standout, particularly over the course of eight rounds against Augustine Mauras and Victor Rosas. In those particular contests, Gaibnazarov was able to to control the tempo of the pace throughout and looked breezy. Next out on January 18th, he’ll face Ricardo Garcia over a scheduled eight rounds to move 7 and 0 but it really shouldn’t be long before the southpaw is knocking on the doors of a world title. Mark your cards, 2019 is going to be a massive year Stateside with the emergence of new players on the landscape but these five are all looking to become a household name over the next 12 months… no pressure!